Bioremediation involved the use of microbes to degrade petroleum hydrocarbons. Quite a number of microbial genera isolated from extreme environment mainly from petroleum-contaminated soils (mesophilic microbes), deep subsurface reservoirs (thermophilic microbes), and sediment under the permafrost (psychrophilic microbes) once inoculated may enhance the degradation/removal of petroleum in extreme environment in field. Limitation in bioremediation at field scale was that the bioavailability and biodegradation of some recalcitrant poly-aromatic hydrocarbons were not enhanced with mixed genera of microbes. Thus further improvement in bioremediation was made when biosurfactant- and bioemulsifier-producing microbial strain such as alasan, strain F2-7, strain TU was inoculated to petroleum-contaminated soils. Considerable increase in the bioavailability and biodegradability of poly-aromatic hydrocarbons was recorded. However the mode of transport and mechanism of intercellular or extracellular microbial degradation of hydrocarbons remained debatable. Similarly biosurfactants and bioemulsifier are expensive, thus limiting their use commercially. Recent advances in the use of nanoparticle to enhance the surface area and bioavailability of hydrocarbons to microbes are under experimentation. Further detail study is required to understand the response of microbes to nanoparticle and then the mode of adaptation and mechanism of degradation adopted by microbes. Appropriate maintenance of microbial population and soil conditions required for effective degradation of hydrocarbons in the field also need further investigation. To avoid this problem, plants are used with microbes and promising results have been recorded in the field. Bioremediation is successful in remediating the surface soil; however, subsurface soil or saturated zone remained unreclaimed with this technique. 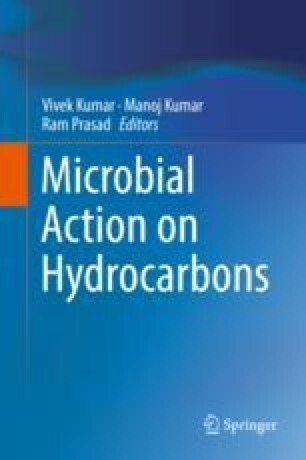 Thus there is need to develop such bioremediation technique that can degrade hydrocarbon from saturated subsurface zone of the soil.